With the widest range of the Western North American species, Lilium columbianum can be found from Northern California to British Columbia in elevations ranging from near sea level to nearly 6,000 (1800 meters) on the western slopes of the Cascade Mountain Range. Some of the most spectacular colonies of this dry land native can be found along the Redwood Highway in Northern California. A nearly impossible subject in the garden, it is best to simply enjoy it in its native realm. Though classified as "dry Land", we found one area in N. California where plants littered the edges of a stream bed with most bulbs covered by running water. 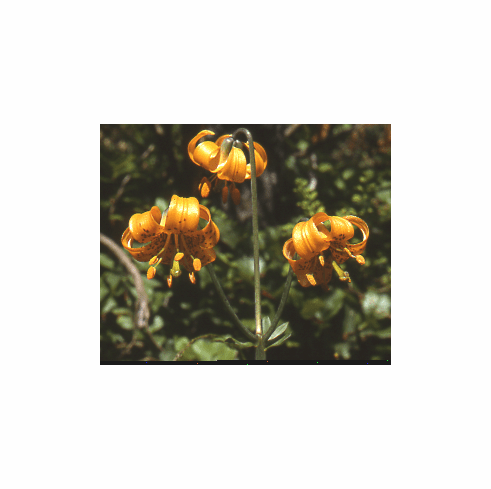 Inset is of photo taken of colony of Lilium columbianum found along the Coastal Redwood Highway SR101 in Northern California. There are numerous stands of Lilium columbianum that were bypassed in the mid 90's with a new, and much straighter highway that went over the mountain rather than around it, hugging the Pacific Coast. Before the bypass, stopping on this busy road for photographs was to risk life and limb. It is narrow and the big rigs traveling that desolate area had drivers that only knew "petal to the metal". Photo inset #2 is of a flower found off hwy 101 south of Eureka showing exceptionally large spots with a solid brown/maroon center where all the spots ran together to make one big "blotch" of color. This particular stem produced flowers of a deeper golden-orange color than others found in the same stand. Photo inset #3 is of a stem of L. columbianum as flowered and photographed by Gene Mirro in June of 2012. Copyright Gene Mirro, all rights reserved. Used with permission. Photo insert #4 is of a beautiful bright "Canary Yellow" form of L. columbianum photographed by Matt Below near Mt. Baker in Washington State. Copyright Matt Below, all rights reserved. Used with permission. Photo inset #5 is of single stem tucked also into native Azalea. Photo inset #6 Though classified as "dry land species", we found one area in N. California where plants littered the edges of a stream bed with most bulbs covered by running water. This stream though getting smaller with the passing of each day in July still covered most of the bulbs we found. By late August or early September, these lilies would have been on "dry land" once again indicating that the seed was dropped there during a period of low water and had to germinate to get a root hold before the winter rains and the swelling of the creek flow. Insert #7 is of an unspotted form of 'L. columbianum' found near Belfair, WA. Thumbnail photo from CalPhotos. Taken by Jerry Murray.